Welcome to the Hero Arts 2018 Catalog Blog Hop! I'm thrilled to be part of it. The 2018 Catalog rocks. Check it out! Details on the hop itself and the prizes are at the end of this post. I paired it with sentiments from You Are Loved Messages. 100% of the profits of this messages set go towards fighting bullying. Got to love that. For the first card, I wanted to create something that looked soft and a little like fog as it went up to the sky. Blended Distress Oxide inks onto the white embossed design and then trimmed the panel. Flicked some water and added a few raindrops. Hint: blending on Strathmore Bristol Smooth paper is a lot easier than anything else I've tried. Then I wanted a colorful, modern, abstract look. Put a small dab of yellow and magenta gouache paints on a craft mat and "painted' the stamped image with the edge of an old parking pass (the hard plastic kind that hangs off your review mirror). The first time I tried it, the gouache covered up too much of the black lines. Toss. (I could have restamped the image after applying the gouache if I had a MISTI big enough to do so. So, I mixed a tiny bit of water it into the yellow gouache with the parking pass, and applied it to the card, and then added some magenta. As I pressed down with the parking pass across the image, the paint spread thin and the colors mixed. I love how the color changed as I added the magenta and played around with the parking pass. Used linen cardstock as it is very white and holds up quite well to gouache as long as you don't add a lot of water. I stamped the image on water color paper, painted with Distress Oxide inks, lifted off most of the paint with a paper towel, and trimmed to get a different skyline. I also chose this set primarily because I "had" to have the giraffe! 1. Too Long -- Get It? And, finally, a non traditional love card. Black "grass" is from the You Are Loved Messages set linked above. Yes, I know the giraffes appear to be walking on top of the grass. My giraffes are magical. If you got this far, thanks!!! GIVEAWAY! Hero Arts is giving away three $50 shopping sprees, drawn from comments left across all blogs in the hop. Please comment by Thursday, February 22nd at 11:59pm PT. Hero Arts will announce the winner the following week. Good luck! Can't wait to see what these so talented stampers have created, because you know it is going to be fantastic. MOOD WHEN DONE = ***Grateful to Libby at Hero Arts for inviting me. I haven't done anything like this for awhile and it was fun. Joan, I'm loving ALL of your fabulous cards! So much fun! It's great seeing the sets in different ways. Acting like an artist my arse! These are AMAZING!!! Your art just says 'HAPPY'. Thank you! Wonderful cards and ideas Joan! You are amazing! Awesome cards! I love that background building stamp. Really cool. I love how you did those giraffes! Adorable! LOVE all your cards! Neither of those sets are ones that would make it on my wishlist normally, but now I want both...oh...and the messages set...so I can CASE these cards! Really beautiful and creative and just...yummy. Love your style and those stamps you've chosen. I really like all your cards. 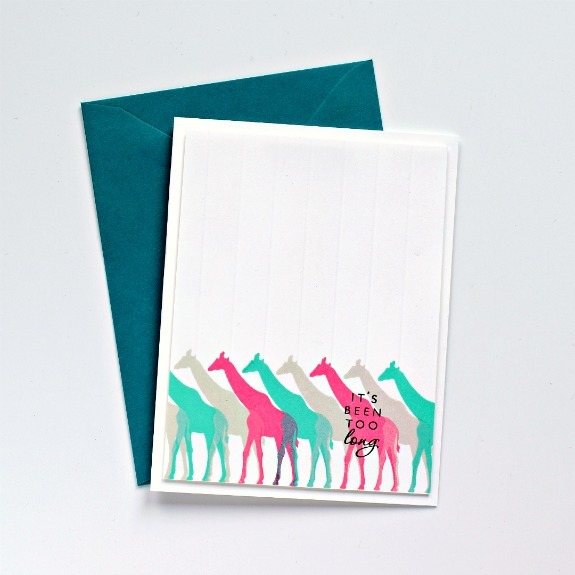 The white embossing with colored background is my favorite but I love love the giraffes too. Thanks for sharing all these new ideas. Love the giraffes card. Thanks you. Love the parking pass card. The skyline stamp is a must have! I love the multicolored giraffes. Thanks for the ideas! These are all great Joan, I especially like the foggy card and giraffes. Loved all your cards. My favorite is the Foggy card. Also realized I have a pad of that Strathmore paper so I am definitely going to try blending on it. Holy cow, these cards are all amazing! I especially love everything you've done with the cityscape. We're talking artistic here! I hear you about stepping away from the flower patch. I'm so stuck there I've grown roots! Great fast cards. Love them. Read the post below this. Thanks for all your help to women and children in need. Love all of your cards Joan, and how you used the same set in such varied ways. Nice cards!!! i am partial to the giraffes all lines up. That is so cute!!! I like how you went from subtle colours to bold vibrant, very nice! It's nice to see the range of designs in the new Hero Arts release. You have a great eye, your creations are outstanding! Love your simple cards, Joan! The vibrancy of the colors you use really makes the cards beautiful! what a fun array of cards, Joan - especially love the first one! I really like how colorful and graphic your cards were. These are amazing! I have to try the first technique! These are all fantastic! Love the giraffes, contemporary buildings - really great ideas! I love the art city card with the wild colors and purposefully crooked buildings. There are so many stamps I love from this release! I have the African animals from last year's kit! This is a great release and I love your cards. Thanks for the inspiration. Love the use of colors in these great cards! and love the new release! Your colorful cards are really beautiful ! Thank you for sharing. Amazing and gorgeous cards - love the colors. How fun to participate in the hop ... you did an amazing job ... love them all. Awesome cards! I love that you stepped out of your comfort zone! Good job! So many neat ideas here - thank you! What a fabulous collection of cards! That city scape stamp is unique and I love the different ways you showed it off. I must have this set. I too, love giraffes. I love your color schemes here! Great inspiration! Great cards! I especially like the parking pass card. I am in love with the safari cards....makes me want to buy the set! I love your colorful cards, especially the giraffe cards! Great giraffe cards. Love the 2nd one with the vertical lines to go with the long necks. Love your cards!! But the last one, is just, awwwwwww! Wow! Beautiful cards and colouring!!! Super cool designs, Joan! Love all the different techniques with the skyline & adore the "too long" card! Thanks for the inspiration! Joan, you ARE an artist and I love the cards that show off your talents. I like the parking pass technique, I will try it with a credit card and see what happens. Thanks for your beautiful work. I love your cards, Joan. They show off your talents. The giraffe cards are cute. My daughter would flip over them. She loves giraffes. 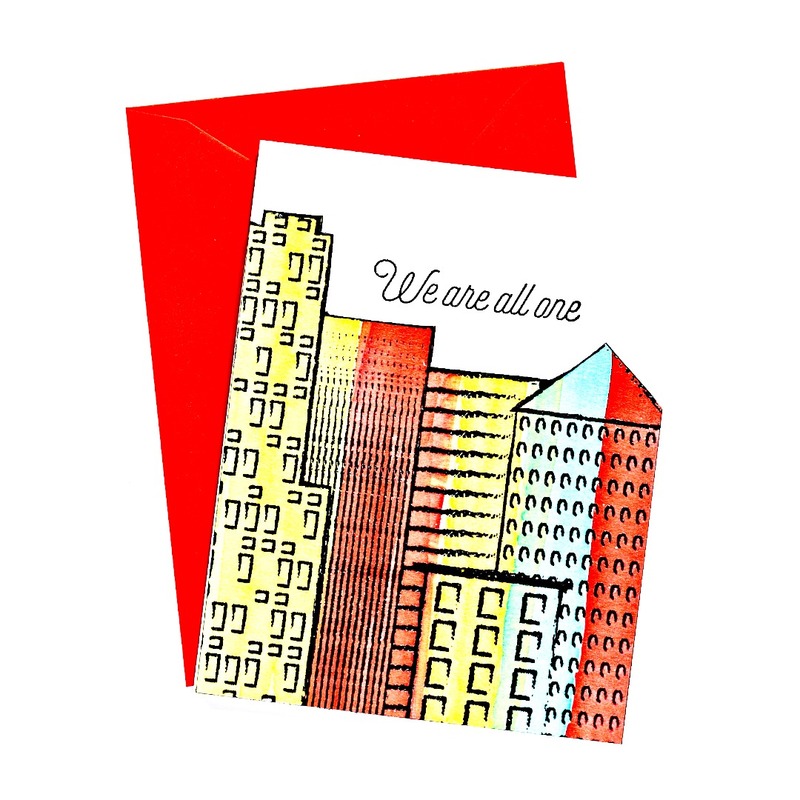 Love your cards - especially the ones with the skyline stamp! I live in NYC so I may have to get that one - and try some gouache! Thanks for sharing! Your cards are inspiring and delightful! So happy to see so many cards. Love the giraffes too. Such fun cards. Ok, I want to live in a world where giraffes are bright pinks, blues and rainbow, too! These are all terrific... love your foggy and artistic cities, too! I love your use of Hero Arts safari set! The simplicity is stunning! Love your simple clean style! So much inspiration! So many cute cards! I am so excited about the skyline stamp and so excited to see it used here....I absolutely LOVE the cards you have created! The gouache one is incredible and probably my fave one, but I really like all of them. The giraffes are AWESOME! I love the first one...those colors together! What fun and creative cards! Your cards are great! Hero Arts new catalog has really got some great new stamps and dies! Thank you for sharing! I like the variety of cards you created. Each and every one of those cards are amazing. 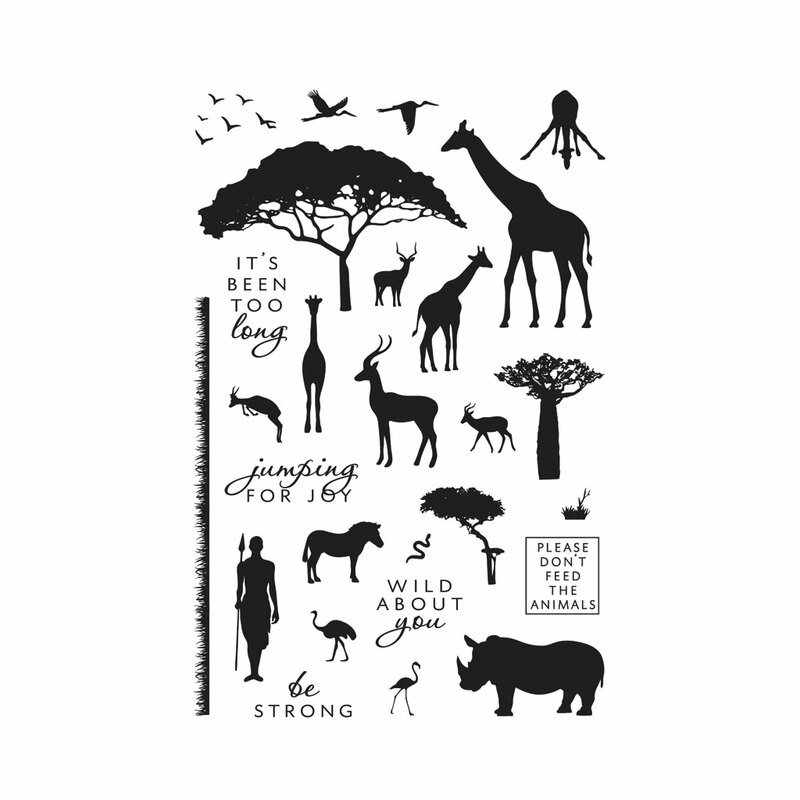 Just love the safari stamps and how you used them. Wonderful cards! My favorite is the foggy skyline card. Thank you for sharing these. Great cards! I love how different they all are - very creative! Wow, what an assortment! Love the animal ones. Love the modern design. Thanks! I must say that I really like the modern design stamp that you used. Like you, I need to get away from my usual themes. Thanks for inspiring me! Your cards are very eye-catching. Beautiful cards Joan, everyone. I love the cityscapes especially the bold yellow and reddy orange one and your giraffes with the score lines heading up are out of this world. Delightful! Thanks for sharing and inspiring. Wow, I love the artsy look you achieved on the first cards and those giraffes are too sweet. They've gone straight to the top of my list. Fabulous!! All such beautiful cards, my fave is the artsy gouache colored skyline, love those vibrant colors! Wow - what a great collection of cards, Joan!! 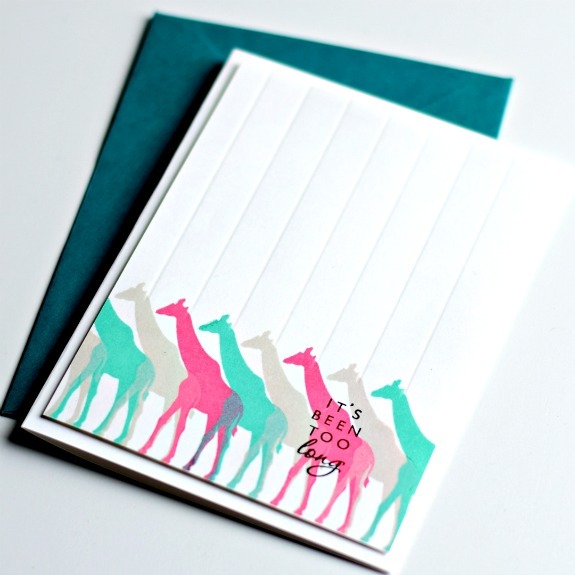 Your giraffe cards are just beautiful! The gouache technique is interesting and your cards are lovely, especially with that abstract background! I'm still not clear on the parking pass technique you described - maybe my second latte hasn't fully woken me up yet. Did you use the parking pass (or hard plastic) as a squeegee? All of these are beautiful and I love the variety of looks you achieved, but my fav is the "Been Too Long" card!!! Love it so much!!! Love the Safari set, and your multi-colored giraffes are wonderful. Your cards are amazing, but I am just loving the abstract skyline ones! I don't have anything like that in my arsenal, and I am loving those! Love the different takes on the skyline stamp. It's great that a change in colour can totally alter the vibe of the card. Thanks for the inspiration. Great cards! I love that skyline stamp! I love all the ideas you have shown with your beautiful cards! Thank you for the inspiration! Great cards, glad you enjoyed yourself. Awesome set of projects. Thanks for sharing. So creative! Love your cards. Love the different looks you achieved with the skyline stamp. I also love the repeated giraffe; the color combo is great. Thanks for the inspiration. Terrific, fabulous cards! Know what you mean, had to have that one too...for the giraffe! I enjoyed your "away from the flower patch" cards. They are all unique and stylish. Thanks. Really love the fun and artsy way you used the skyline stamp! I enjoyed all the cards. I especially liked how you scored from the giraffes neck to the top of the card! Just that extra little oomph! Great job! Fantastic cards! So fun to see the same stamp sets used in multiple ways. love all the cards you share...thanks for your inspriation! Wow!! 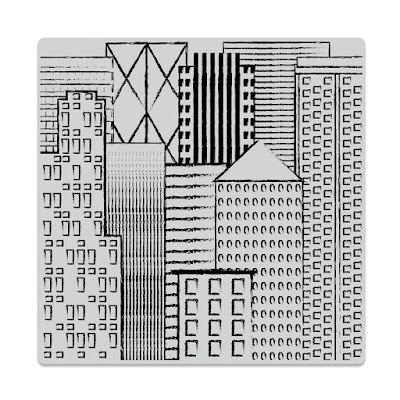 Love all your cards & am seriously thinking of getting that cityscape stamp!! Joan - Don't know if you'll get this far down in the comments section but I absolutely LOVE your cards. Your style is different from mine so I get great inspiration from your work. Your truly have an artistic soul! I would NEVER give these stamps a second glance, that's how far outside my norm they are. But your interpretation inspires me to open my eyes and really look at images in a different way. Thanks for sharing your work with us! Very creative cards! 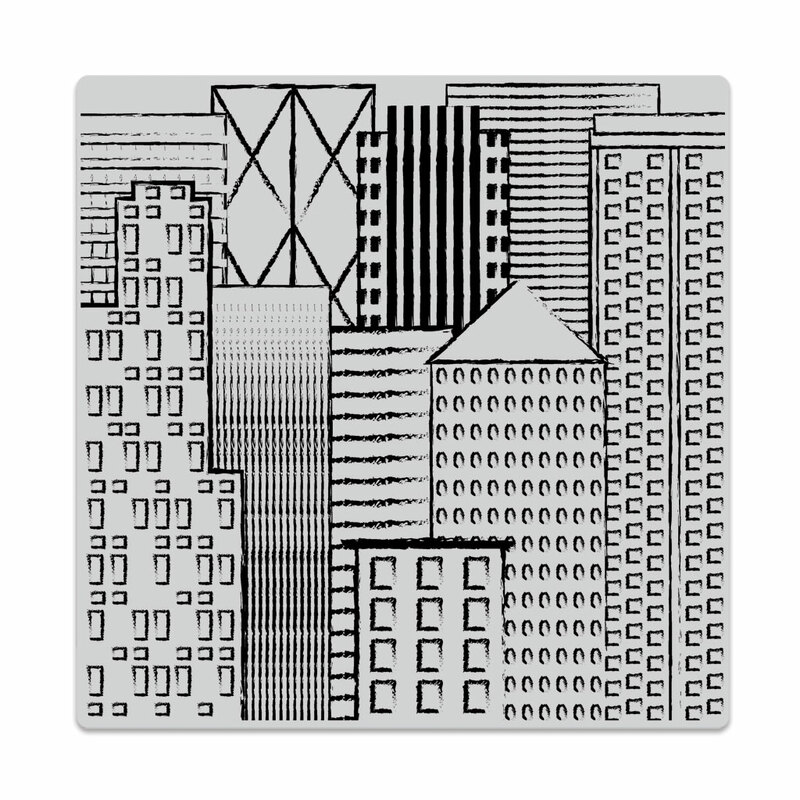 I'm loving both city background stamps. When I saw the city stamp I did not like it. But then I saw how you used it and my opinion changed. I love what you did with it. Those soft tones on the first card are lovely! I also really like the giraffe cards. They are wonderful! These are wonderful! 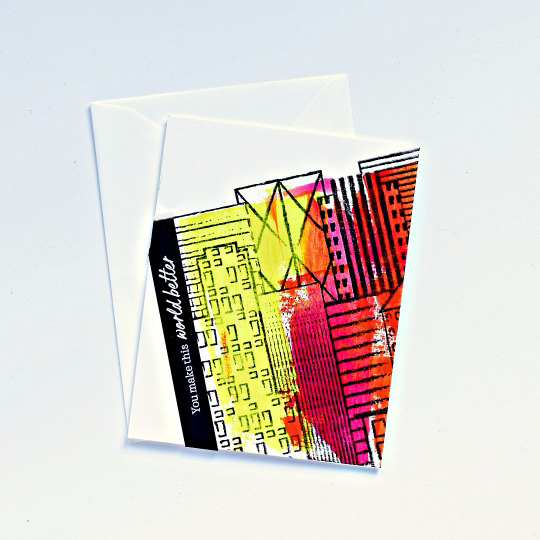 I especially love the city scape ones, especially that second one with the bright colors on an angle, LOVE! This is such a fantastic set of cards !! I love your unique way to play with colours ! I love the play on words & use of color. Creative uses of the skyline stamp. What awesome cards! I love their unique style! Amazing cards. Love the Abstract Skyline Bold Prints. Great cards! I especially like the giraffes, my daughter adores them! Your magical giraffes are my favorite! Wow!! Awesome cards..Love each one of them... Love the abstracts one so much. I enjoy your sense of whimsy with these. From the "super artsy" to your magical giraffes, I would be happy to receive any one of these cards. :D Thanks so much for sharing! What wonderful cards! They are just so different from the normal. I love it!! 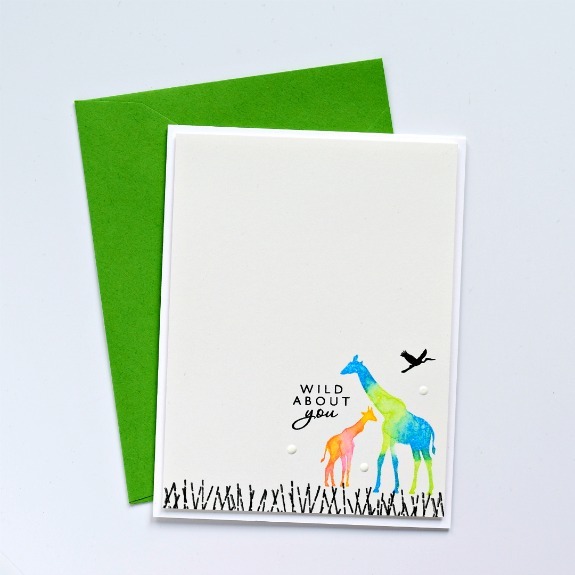 Love what you did with the bold background stamp and your different coloured giraffes are awesome. You've inspired me to think outside the box. Thank you!! I love your bold background stamp card!! Thank you for the fresh look! Beautiful, unique cards. Love your bright colors! Thanks to everyone for great products and inspiration. All great cards! My favorite is the first one: something about the blending and that bright white at the top make it stand out to me. Thanks for sharing. Wow it is refreshing to see some really interesting cards! I love giraffes too! Great cards, I love the ones with the Abstract Skyline stamp, so diverse. You showed, also with the Safari stamp, what you all can do with one of those stamps. Thanks for the idea's and grogeous examples. Love the playful cards, so fun!! Those are really great cards! Love the style! That foggy city card is particularly beautiful. It makes me think of Paris, for some reason.